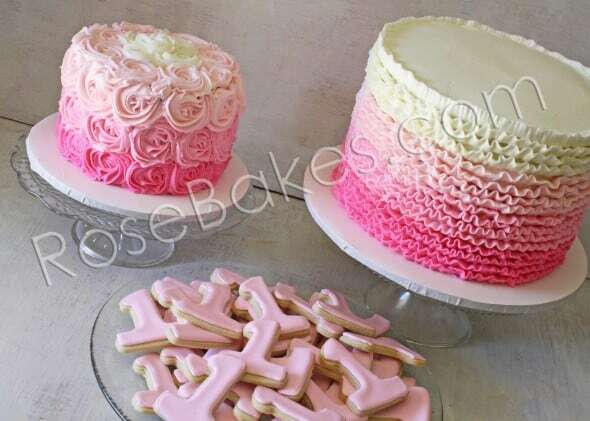 Today I want to share with you a Pink Ombre Ruffles and Roses 1st Birthday Cakes and Cookies! First up… the “big” cake! I was super nervous about the ombre ruffles cake. On the inside it was four layers of confetti cake and it was over 7″ tall. Then on the outside…. those ruffles were all vanilla buttercream in shades of pink. 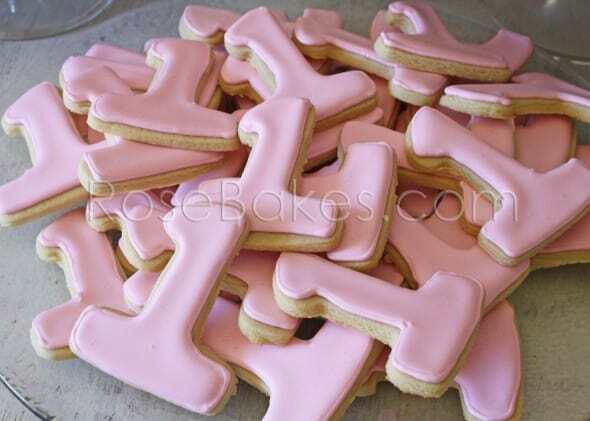 I used a Wilton tip #104 (I have several that size) and made 4 different bags with the shades of pink. That way I could move seamlessly from one color to the next. To make sure I did equal sections of each color, I actually measured and gently marked the cake underneath. I was able to know ahead of time that 4 rows of ruffles for each color would work out perfectly! For the smash cake, it was two layers of confetti cake and I used the same pink frosting to do the roses. 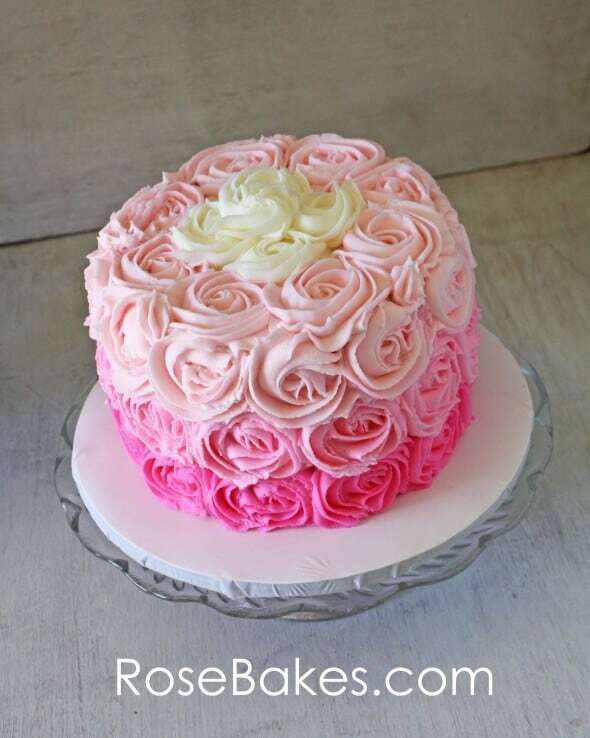 I did a similar pink ombre roses cake here and you can check out that post for more details. Then there were the cookies… I used my favorite roll-out sugar cookie recipe and royal icing recipe. 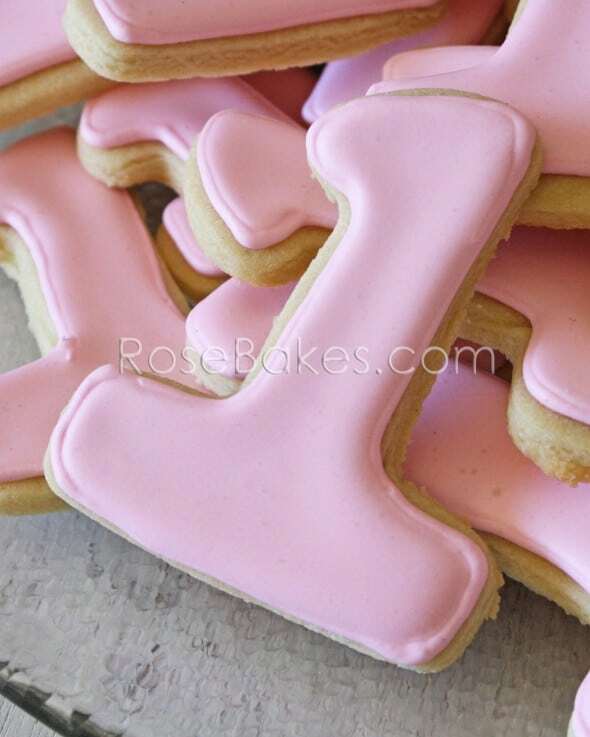 I just rolled out my dough and first cut out the bottom shape with part of the “H”, careful not to press in on the top half (with it turned sideways) then used the top part of the “1” cutter to get the little top serif on the one. I know I say this all the time, but I really loved these goodies The soft pinks and ruffles and roses were simple but elegant and pretty – very girly! What do you think? Do you have any questions about these cakes or cookies? Please leave me a comment and I’ll answer and help out if I can! Love these! They are so beautiful. Great thinking on how to make the #1 more substantial! Your ruffle cake is Stunning Rose!! Thank you Anna! 🙂 Hugs!! simply beautiful! perfect for my daughters 1st birthday! but how did u create the ruffles and roses on the cake??! looks confusing. I just have to say you are amazing! All of your cakes are beautiful! Makes me want to continue decorating cakes. 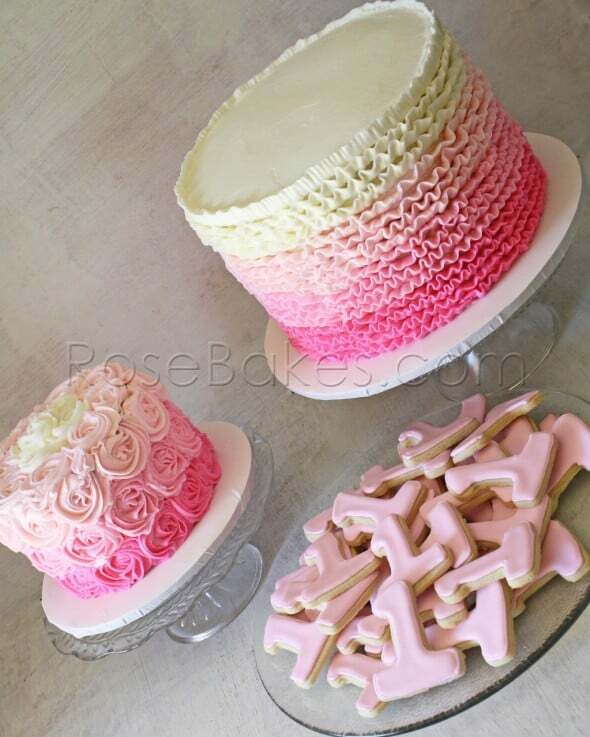 Did you use neon pick icing color or just a regular pink for the ruffles? I’m not sure because it’s been quite a while – but just by looking, I’d guess that I used Wilton pink gel coloring instead of the electric pink. 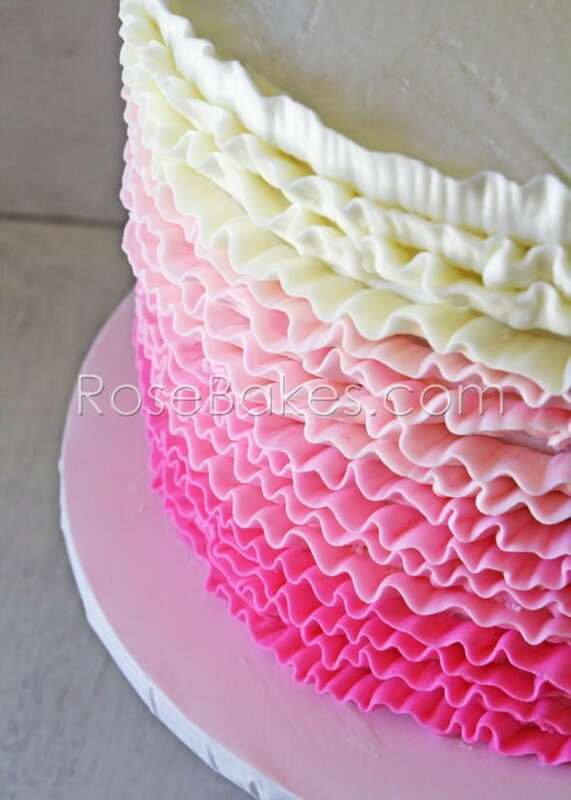 I love your ruffle ombre cake and would love to learn the ruffle technique. I would love to see a tutorial on the ruffles! I tried it this weekend unsuccessfully. Thanks for sharing!!! Hi Rose! 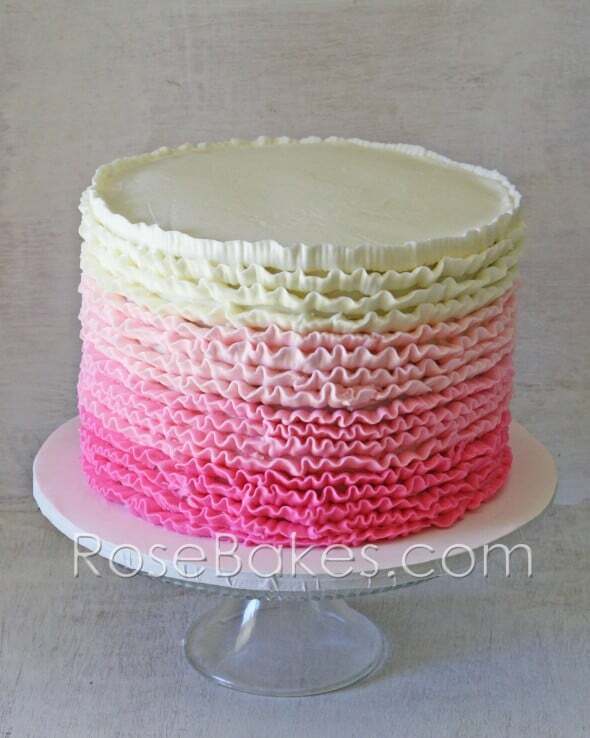 I just got a request for a pink ombre’ ruffle cake. Any tips or tricks? I’m attempting to do a “practice” cake this weekend but I want to make sure that I’m doing everything right! Just make sure you pipe the ruffles onto a fresh (non-crusted) layer of frosting. Be sure to put the fat side of the tip on the cake and push it just enough to make sure they adhere! Nothing else comes to mind right now, but best of luck! Thank you for the advice!! I’ll let you know how it goes! Absolutely stunning. How do you keep each ruffle layer from touching the layer below it?? I pipe with pretty stiff frosting and it holds it’s shape well. If you use frosting with the right consistency and hold it at a good angle – it’s easy-peasy! Your cakes are stunning! I wondered if you have a stiff buttercream recipe on your website for the ruffle cake? What can be done on top of the ruffle cake if I don’t want it plain? Some people do ruffles all over the top as well (in circles). Or you could add a topper or initial.